Member since March 9 2012. The International Federation of Red Cross and Red Crescent Societies (IFRC) is the world's largest humanitarian organization, providing assistance without discrimination as to nationality, race, religious beliefs, class or political opinions. 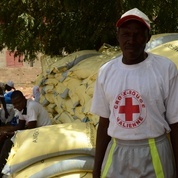 Contributions come from The International Federation of Red Cross and Red Crescent Societies volunteers from the field.